It's that time of year again folks: the world-famous festival of fake blood and tackiness known as Halloween. In my local pound shop, called George’s Mini-Market, you can buy vampire teeth, horror masks, wigs, face paint, skeleton costumes, glow-in-the-dark fingers and vampire's blood from anywhere between 10p to £2. You can buy all the same things everywhere else too. The windows of all the shops are full up of the stuff. Meanwhile in one of the posh craft shops in our town they have a proper witch's broomstick in the window, obviously hand made. They also have a witch's hat. My sister went in and asked how much the hat cost and they laughed. They got it from Woolworths, they said. When I was on holiday in Romania last year I went to Bran castle in Transylvania, which is popularly known as "Dracula's Castle". They were selling all the same tat there too. It's an international conspiracy. Why go to Transylvania when you can buy your Dracula gear from George’s Mini-Market? 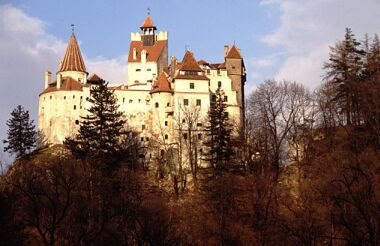 Actually the only connection between Bran Castle and Dracula is the fact that the movie Bram Stoker's Dracula was filmed there. The real historical Dracula, Vlad the Impaler, may have spent a night there once. "Dracula" was one of his titles. It means "Son of the Dragon". Bram Stoker based his own Dracula's Castle upon one in Scotland which he also visited only once. So Bram Stoker and Vlad the Impaler have one thing in common. They both only ever went to Dracula's Castle once. A few years back Christians used to get very upset about Halloween. They would send scary letters to the newspapers accusing anyone taking part of "occult practices". Fortunately this kind of superstitious scare-mongering seems to have died out in more recent times. Or maybe it’s that Christians don't want to be accused of being spoilsports any more, when secretly they still disapprove. The first time I was ever published was in my local paper in a letter sent in reply to one of these letters, which I signed "Puck". It filled up almost half a page and the editor added a disclaimer to it. "The views expressed in this letter are not necessarily those of this newspaper." 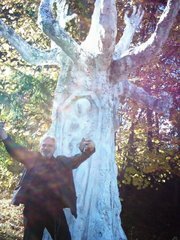 I was going through a pagan phase at the time. In pagan circles Halloween is called Samhain, and is the Celtic New Year. It is a very ancient festival indeed, and involves a meal in which an extra place is laid out for the visiting dead. It had mainly died out in England due to its replacement by Bonfire Night, but was revived recently as an American import after the popularity of Steven Spielberg's ET, which used Halloween night as a convenient plot-device. These days the ET costume has become a part of the Halloween tradition. If ET was around now he wouldn't have to wear a sheet over his head. He could come as himself. Sainsburys, meanwhile, is refusing to sell flour or eggs to under 16 year olds. Apparently this is to do with the practice of egging people's houses as part of Trick or Treat. It seems to work. Or so he claims. I’m from Birmingham originally. Not a DFL, a DFB. Down From Birmingham. When I was a youngster we used to go out to a piece of woodland just outside the city called Chelmsley Wood. Later the area was developed and a large council estate put there (1). At one point it was the largest council estate in Britain. It looks like Lucerne Drive (2) but is almost as big as Canterbury, if you can imagine that. Lucerne Drive with Elephantitus. It was designed and built in the 60s. It has a town centre with shops and car parks, and a number of pubs. The pubs, of course, have no soul, being all the same, without history or atmosphere, and just being kind of plonked down anywhere as an afterthought. As the years went by the pubs became increasingly decrepit and nasty. You wouldn’t want to go into a Chelmsley Wood pub without an armed guard. I think that Baghdad is probably safer than a Chelmsley Wood pub on a Saturday night. The reason I am telling you all of this is that I’m looking at a drawing of a Chelmsley Wood pub right now on the internet. 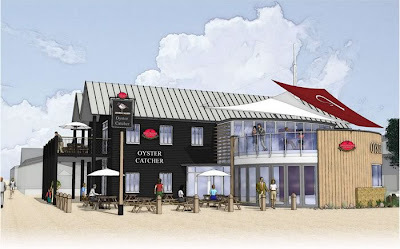 It’s called The Oyster Catcher and is Shepherd Neame’s proposed development plan for Whitstable Harbour (above). OK, I’m probably exaggerating here. I’m sure that The Oyster Catcher will be sensitively designed and built to take into account the ambience of its surroundings. That is, like every new building in Whitstable these last few years, it will be slapped all over with Kent weatherboarding. But the question still remains: who on earth thinks that Whitstable is in need of another pub? Whitstable has some of the best pubs in the world. Pubs with real character and real atmosphere, not crude mock-ups plastered with weatherboarding to give them that “authentic” Kent look. I didn’t manage to get to see the development proposals for Whitstable Harbour when they were on display in the Horsebridge. Fortunately they are still available on the Canterbury City Council website. So I’m looking at the various options now. Shepherd Neame’s attempt to recapture the spirit of a 60s council estate in the shape of a pub is actually the least objectionable of the proposals. One of them looks like a spaceship, and another one looks like a circus (3). I like these architectural drawings. They are exercises in creative fantasy. The design that looks like a spaceship also looks like it about to take off into the wild tumultuous skies. However I’m puzzled as to why the council thinks the harbour needs developing. I don’t know about you, but I actually like the buildings that are already there. Crude but functional, you might say, and entirely appropriate for the environment, this being a working harbour. Perhaps a larger version of the very successful market would be more in keeping? That’s what attracted me to Whitstable in the first place. It is a real living town, not a theme-park parody of itself like Canterbury. My aunt sent me a set of photos over the internet. They purported to show a little girl being punished for stealing in Iran. The photographs showed the little girl with her arm being forcibly held out while a car was running over it in order to break it. The pictures were accompanied by some virulent anti-Iranian text. I say “purported to show” and you already know what my attitude to these photographs is likely to be. They may have been faked. They could have been mocked-up in Photoshop, or the result of a staged enactment. Even assuming they were showing something real, there is nothing in the photographs to indicate where they may have been taken. It could have been Iran. It could have been Turkey. It could have been any one of a dozen different countries in the region. For those of you sceptical of my scepticism, I would just like to remind you of the lies that got us into Iraq, and that German soldiers in the First World War were accused of bayoneting babies. 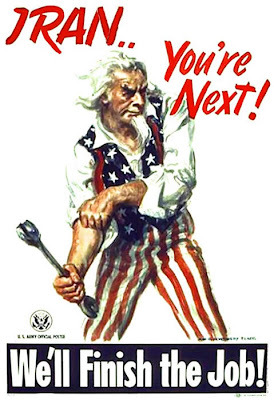 I think we all know by now that we are being set-up for a new war, this time against Iran. If you think the war in Iraq was a disaster, just you wait. A war against Iran would be apocalyptic to say the least. Unlike Iraq - which was a country already on its knees from years of sanctions, continual bombings and the bloody after-effects of the previous devastating war – Iran is a fully-functioning advanced radical state with a motivated and armed population. It would not be such a push-over. Iran has always been the real enemy, having dumped the American-backed Shah in their Islamic revolution, and having backed some of the key anti-American/ anti-Israeli forces in the region, like Hamas and Hezbollah, for a number of years. It is also almost certainly backing some of the Sh’ia based militias in Iraq, something that will no doubt provide the justification for any future attack. But - it has to be said - complaints about “interference” from an occupying power about a regional neighbour is patently absurd. It would be like Nazi Germany complaining about “interference” by Britain in the affairs of Vichy France during the Second World War. The Americans have already built a small army base on the Iranian border, supposedly to stop incursions into Iraqi territory. This is a joke. You only have to look at the map to know this. There are 200 American troops in that base. The idea that they can have any effect on cross-border incursions in a desert region along such an extensive border is laughable. More likely they have been put there as an act of provocation. There are also British troops on the southern border, so expect to see a re-enactment of the capture of British sailors earlier this year. British troops are being used as bait in a nasty propaganda war, which will, almost certainly, turn into a real war in the end. 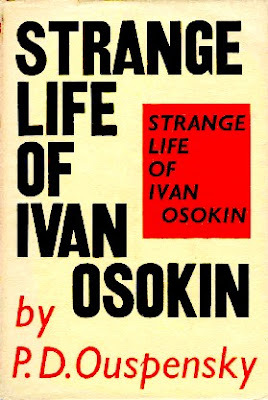 One of my favourite books is The Strange Life of Ivan Osokin by PD Ouspensky. The central character is a failure who finds himself at a dead end in his life. Broke, bereft, emotionally and academically ruined, rejected by the woman he loves and contemplating suicide, he wishes he could live his life over again, but with hindsight this time, knowing everything that he knows now. Then he meets a magician who offers him that chance. But first the magician gives him a warning. “Remember this moment,” he says. After this the hero is catapulted back in time, to the exact moment when he believes he had made his first great mistake, and in his confusion, finding himself a fully developed older man in a child’s body, proceeds to make exactly the same mistake again. Thereafter the book is a catalogue of continuing errors, in which the character does everything he did in his first life while slowly forgetting that he had ever made this return journey. In order to fit in, he reverts to his younger self, becoming, once more, a child in a child’s body. But he is plagued by a sense of repetition, of deja-vu, as if he has been here before. There’s a terrible inevitability about the story, like the wheels of fate moving inexorably on, and a sense of echoes-in-time. There is also something unsettlingly familiar about tone of the story - a kind of resonance - as if you yourself know some of this already: as if you, the reader, also exists in a time-loop, as if you’ve been going round and round in time throughout all eternity. It’s just that you keep forgetting, that’s all. Which is - maybe - not so far from the truth. I had a weird little revelation the other day. I was thinking about reincarnation. I suddenly thought, “what if time is not sequential”: by which I meant that maybe time is like that loop in the PD Ouspensky story, or like the ever-repeating cycle of events in Groundhog Day. Not a straight line but a circle, going round and round and round. I which case, I thought, when we die we don’t necessarily go on to the “next” life as such, but we can go back to any of our lives at any time in history. Each life is the same life, but with a different historical backdrop. This was my revelation. We have to keep on coming back and back until we get it right. I’ve been thinking about this a lot recently. Maybe each time we come back we set ourselves a new riddle. That is how we develop. It’s not that there is some outside force judging us. We judge ourselves. One part of us is eternal - consisting of the whole of our experience throughout time - while the other part, the familiar little bit that we consider ourselves to be, that lives out our small dramas on this planet, is on an endless journey to find our selves. It’s a bit like a soap opera. If you already knew the outcome of the story then it wouldn’t be worth watching. So it’s like the eternal “you” sets itself a puzzle - a plot-device, an interesting conundrum - which the mortal “you” then has to find the solution to, and that you have to keep on coming back and back till you’ve sorted it out. Then it’s on to the next sequence. In the Ouspensky story the hero finds himself right back where he started, in exactly the same mess. Only this time he remembers that he has been here before. It is at this moment that he is able to move on. It is at this moment that he is finally free.